Çeşme is a charming convergence of healing mineral springs, excellent beaches, crystal clear waters and sun are perfect for vacationers. 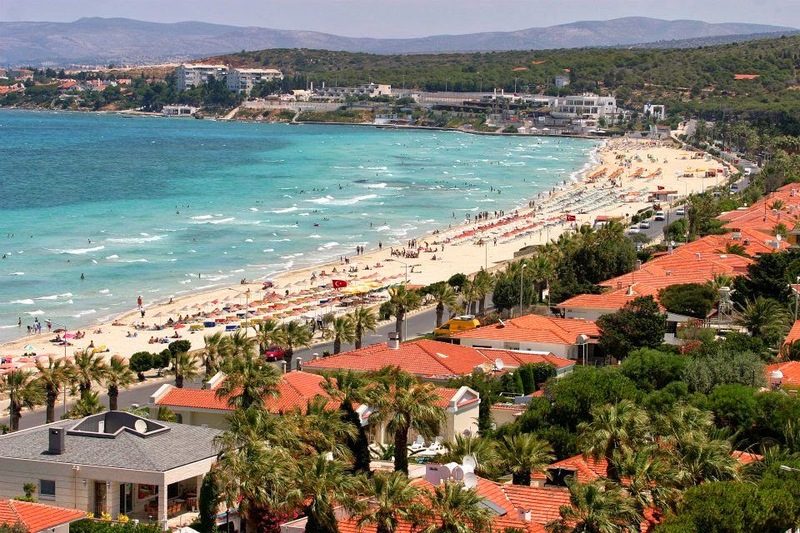 It is located 94 km in west of İzmir, on the very tip of the peninsula that bears its name. It was called as the 'little harbor' by sailors, but in the course of time, the area became known as Çeşme (Fountain) due to the increasing number of fountains with ice - cold waters. The Erythrai Ancient City excavated in (the village of) Çeşme-Ildırı, the Castle, Caravanserai and many fountains from Ottoman Period and the other examples of civil architecture in the historical texture of the city compose the historical and archaeological remains of the area. Today the remains of the Acropolis can be seen on the top of the hill which is in the city centre. Small statuettes offered to the Temple of Athena Pallas were found during the excavations in the Acropolis. One of the most important finds is the statue of a woman belonging to Archaic Age. It is on display in the İzmir Museum of Archaeology. Çeşme is a port of Erythrai Ancient City, was called as Cyssus in Ancient Times. It was an important settlement area in the 6th century BC. The city developed its trade by establishing relations with Egypt, Cyprus and Western Countries.